When you think of a self-driving car, you probably think of Google's little project. And exciting as that is, we still have to wait a long time for pay-off. And even then, you can bet it'll be pricey. Researchers in the UK are working on their own version of the tech, and it stands to be a lot cheaper. Maybe as cheap as $150. 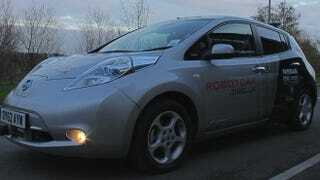 RobotCar, a tricked out Nissan Leaf, is a project currently under development by researchers at the University of Oxford, and the minds behind it are giving themselves an extra little challenge: it's gotta be cheap. So far the system, which uses stereo camera and lasers, runs about $7,750, but researchers are hoping they can knock that down by a factor of ten, and then all the way down to $150. Really, we do need to solve the engineering challenges of not relying on expensive sensors, but relying on cheap sensors. But doing some really smart things with those cheap sensor feeds. At prices like that, you're going to have to make some compromises, and chief among them is that RobotCar will need you to teach it a bit. As you drive your RobotCar to work or to the store, the car's systems will be keeping a close eye on the route and, eventually, will know enough to take over for you. RobotCar's been tested on some private roads, and with a go-ahead from the UK Department of Transportation, it should get some public road time soon. Hopefully it works out, because $150 for trouble-free commutes sound preeeetty nice.